Since Krom Dragongaze appeared in the Curse of the Wulfen campaign book, we’ve received a lot of questions about him. So here’s our Krom Dragongaze tactics to help you get the most out of this stubborn and ferocious Wolf Lord. The Wolf Lord Krom Dragongaze is a roaring tyrant who smashes those who cross him into the dirt. Blunt, stubborn and brutal, his beligirent tactics earned him the scorn of Great Wolf Logan Grimnar for his Great Company’s hunting aggression and glory seeking. His reputation of ‘fierce-eye’ is justly deserved however, for the intensity of his stare is unnerving and with a single glare, he discerns the weaknesses of the enemy and misgivings of allies alike. It is then that Krom begins his gory work. 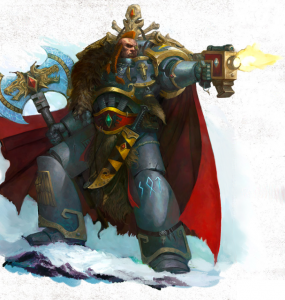 But in game terms, Krom Dragongaze is an alternative Wolf Lord choice that comes with Furious Charge, Stubborn and the Saga of the Warrior Born Warlord Trait, as well as a Master-Crafted Frost Axe and some additional special rules. Equipment: Bolt Pistol, Frag Grenades, Krak Grenades, Belt of Russ, Wyrmclaw (a Master Crafted Frost Axe). Krom may re-roll all failed saving throws when within 3″ of an Objective Marker. Krom may re-roll all failed To Wound rolls in close combat. If Krom Dragongaze is taken as part of a Drakeslayers Legendary Greatpack core detachment, he grants all Space Wolves in this core detachment the Furious Charge special rule while he remains on the board. He also gains the Monster Hunter, Preferred Enemy (Characters), Furious Determination and Glory Seekers special rules if taken as part of a Drakeslayers Legendary Greatpack core detachment. If Krom Dragongaze is stood defiantly upon an Objective Marker and able to re-roll his 3+ or 4+ Invulnerable saves, he is a difficult target to remove with shooting or close combat attacks. Combine this with his ability to re-roll to wound in close combat with his Strength 6, AP2, Master-Crafted Frost Axe “Wyrmclaw” and he is someone you would really rather not be facing in close combat. And you can be that Krom will be issuing challenges to keep the close combat in his favour. Don’t forget that he has Saga of the Warrior Born, so the kill tally will rise steadily once he gets Wyrmclaw into the ‘swing’ of things! 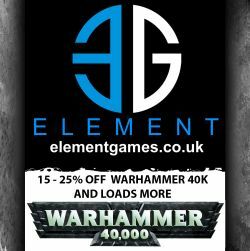 Although the chief face-beaters of Warhammer 40K, such as Kharn the Betrayer and Abaddon will still make short work of him. This makes him a good Wolf Lord, but not a GREAT Wolf Lord. To make him really shine (and confidently issue Challenges), you should take him as part of a Drakeslayers Legendary Greatpack core detachment. This gives him Monster Hunter, Preferred Enemy (Characters), Furious Determination and Glory Seekers special rules. Now, the only challenge is getting him on an objective in your enemy’s deployment zone and into close combat so he can begin his gory work. First you will want to place your objectives where you think you will want Krom to play his part in the battle ahead. Then you will want to place Krom in a Drop Pod to make sure he gets there quickly and unscathed. Using him to hold one of your own objectives would be a fat waste of 150pts! Now, give him a pack of 9 Blood Claws led by a Wolf Guard Pack Leader to provide ablative wounds and some additional close combat clout. I would suggest Wolf Guard Terminators, but 4 models isn’t enough to keep him alive. Your opponent will be trying to take out Krom quickly because he’s your Warlord and he’s tough to kill if he gets into close combat near an objective. Then you need to decide if he does down in your first wave of Drop Pods or goes into Deepstrike Reserve. Probably the latter to reinforce your attack. As you can see, where Krom is going to pursue an objective will be an important part of your overall strategy! I like Krom Dragongaze’s personality and character, but in gaming terms he’s very tricky to use, is quite expensive for what he does (needs approx 200pts of Blood Claws and a Drop Pod to back him up) and requires some serious micro management. You’re looking at a 350pts investment. There are safer, more reliable options available. However, if your army list is light on troops and you need to swarm the board with bodies somewhere, then Krom leading a large pack of Blood Claws, Counter-Charging into the enemy on a key objective could be an awesome addition. 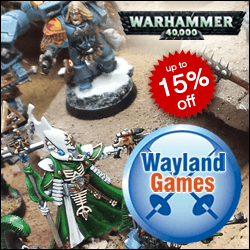 He’s a stunning miniature and you’re likely to have some Blood Claws and a Drop Pod in your collection. So why not give him a try?